iPhone 5S, iPhone 6 or something else? 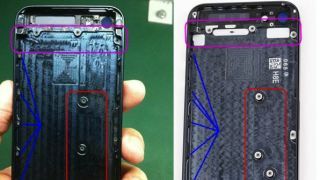 A report out today claimed that parts and components for Apple's next iPhone have begun arriving at Chinese manufacturers, though we recommend taking the news with a few hearty shakes of sodium. Apple blog Patently Apple cited "a new Chinese report" and claimed that "Apple's noisy supply chain is at it again." Manufacturers along that supply chain have supposedly begun receiving the parts that will be necessary to build the next iPhone, which Patently referred to as the iPhone 5S. However, it's unknown what Apple's next smartphone will actually be called, as the Cupertino company could very well skip straight to the iPhone 6 or something else entirely. Patently Apple claimed that those unnamed Chinese sources believe production on the new iPhone will actually begin in July, as two months between parts arriving and production beginning is reportedly standard. Further, Foxconn's Apple product production lines are supposedly the manufacturing giant's most efficient facilities, and Foxconn (also known as Hon Hai) has plans to bring the rest of its lines up to speed this year. The implication in all of this is that Apple has moved up its parts deliveries so that it can launch the next iPhone earlier than the traditional annual September release it's stuck to in the past. Rumors surrounding the release of the next iPhone involve multiple versions of Apple's new flagship, with a cheaper iPhone possibly launching at some point as well as the requisite iPhone 5S/iPhone 6. Either way, recent research suggested that iPhone users will likely elbow past Android fans by 2015, and Apple may have something up its sleeves to help ensure that that happens.